WIN 1 of only 1,000 Bottles of OPI Switchboard Starlet and a Copy of Nails: The Story of the Modern Manicure! Happy Monday! I have lots of awesome stuff to share this morning! Stick around to the end to enter my international giveaway featuring the new book Nails: The Story of the Modern Manicure by Suzanne Shapiro and the polish created by OPI just for the book's release (and not available for purchase anywhere)! Read on to learn about Nails and get the skinny on the polish direct from the author! 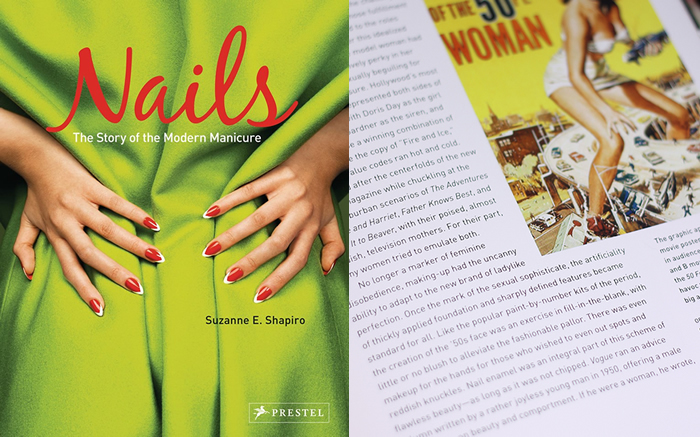 In Nails: The Story of the Modern Manicure from Prestel Publishing, author Suzanne Shapiro thoughtfully chronicles the fascinating 3,000 year old history of the modern manicure. Starting in ancient times and concluding with current nail trends, the book is illustrated with lots of pop culture images, fashion photography and classic adverting. Nails also features six photo essays, including my favorite, a visit to the OPI factory. Throughout the book, I learned some truly incredible facts and made many "aha!" cultural connections I hadn't thought of before. For instance, the popularity of nail lacquer in the 1920s was boosted in part by the attractiveness of a woman smoking a cigarette. Makes sense, doesn't it? For a nail polish-obsessed book nerd like me, Nails is great read and an awesome addition to The Mani Cave. It would make a nice gift for any manicure lover. To accompany the release, Shapiro had the awesome opportunity to create a special OPI promotional polish. Only 1,000 bottles of Switchboard Starlet, a silky-smooth, semi-sheer, watermelon red, was produced for certain media contacts, book event guests, and attendees of Book Expo America (a publishing conference). Switchboard Starlet does not come with the book and isn't available for purchase by consumers. As a researcher at The Costume Institute at the Metropolitan Museum of Art in New York, Suzanne Shapiro is highly qualified to write this story. Both NAILS and Nail It! magazines have recently featured great interviews with Shapiro (go check them out!). I had the opportunity to ask her some questions myself, so I (of course) honed right in on the polish! WPP: Did you set out to collaborate with OPI or did that evolve during your research? Shapiro: Last year, I was lucky enough to go on a factory tour of OPI in Hollywood, and we shot a behind-the-scenes photo essay that appears in the book. While there, Suzi Weiss-Fischmann generously offered to produce a promotional shade in honor of Nails. Of course I was thrilled! WPP: What was the inspiration behind Switchboard Starlet? What part of the idea came first? The name? An era? The color or finish? Shapiro: The finish and color came first. As a "manicure historian," I've always wanted to find more semi-sheer nail polishes whose finishes are closer to the quality of 1920s and '30s polishes. I happen to love that era of the “moon manicure” and the slightly translucent color that usually went with it. I thought a watermelon-red would be great for this vintage style and appeal to everyone who enjoys red, pink, or coral, and Suzi found the perfect formula.I named it Switchboard Starlet as a tribute to the first generation of nail-painting women, including the leading ladies who epitomized Hollywood glamour and all the working women who made beautiful nails a part of their personal style. I didn't learn until later that my close friend's grandmother had been a switchboard operator who always sported a chic manicure. I was so happy to give that lovely lady one of the first bottles! WPP: Suzi Weiss-Fischmann is nail polish royalty. Did you get to collaborate with her personally to develop the polish? What was that like? Shapiro: I did, and she’s wonderful! It’s amazing how someone with such a demanding schedule can be so responsive to every detail, and it’s clear how passionate Suzi is about color and fashion. WPP: In the book, you discuss the impact the web has made on the modern manicure. I knew there were a lot of nail blogs, but I was shocked to read that NAILS Magazine estimates there are over 35,000! Do you think society’s current obsession with all things nails has peaked? What role, if any, do you see bloggers play in the next evolution of manicure? Shapiro: I hope not! What I tried to convey in my book is how nail fashions have adapted to women’s changing values over the years. Whatever the future holds, I highly doubt that we’ll abandon the appealing, expressive, and accessible virtues of the manicure. As the nail care industry offers an ever-increasing array of products and new boutique brands spring up each year, the widely-circulated opinions of nail bloggers will help insure that quality and uniqueness will continue to matter. And when it comes to nail art, more and more people will be inspired to take a short-term risk and try something bold and new! While Switchboard Starlet isn't available for purchase, Nails: The Story of the Modern Manicure can be found at major bookstores and Amazon.com for $21.86. Like Nails and Prestel Publishing on facebook for more info. Now it's your turn to win a copy of the book and a bottle of OPI Switchboard Starlet! This giveaway is open internationally. Please read the Terms & Conditions in Rafflecopter for the complete rules. Good luck!